Houghton Mifflin Harcourt, 9780547567846, 288pp. A triumphant portrait of a resilient and courageous woman and the life she might have lived . 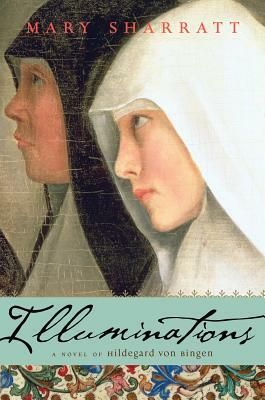 . .
Skillfully interweaving historical fact with psychological insight and vivid imagination, Sharratt’s redemptive novel, Illuminations, brings to life one of the most extraordinary women of the Middle Ages: Hildegard von Bingen, Benedictine abbess, visionary, and polymath. Offered to the Church at the age of eight, Hildegard was entombed in a small room where she was expected to live out her days in silent submission as the handmaiden of a renowned but disturbed young nun, Jutta von Sponheim. Instead, Hildegard rejected Jutta’s masochistic piety and found comfort and grace in studying books, growing herbs, and rejoicing in her own secret visions of the divine. When Jutta died some thirty years later, Hildegard broke out of her prison with the heavenly calling to speak and write about her visions and to liberate her sisters and herself from the soul-destroying anchorage. Riveting and utterly unforgettable, Illuminations is a deeply moving portrayal of a woman willing to risk everything for what she believed. MARY SHARRATT, the author of seven critically acclaimed novels, is on a mission to write strong women back into history. Her novels include Daughters of the Witching Hill, the Nautilus award-winning Illuminations: A Novel of Hildegard von Bingen,The Dark Lady’s Mask: A Novel of Shakespeare’s Muse, and Ecstasy, about the life, loves, and music of Alma Mahler. She is an American who lives in Lancashire, England. "An enchanting beginning to the story of the perennially fascinating 12th-century mystic, Hildegard of Bingen. It is easy to paint a picture of a saint from the outside but much more difficult to show them from the inside. Mary Sharratt has undertaken this with sensitivity and grace." "I loved Mary Sharratt’s The Daughters of Witching Hill, but she has outdone herself with Illuminations: A Novel of Hildegard Von Bingen. She brings one of the most famous and enigmatic women of the Middle Ages to vibrant life in this tour de force, which will captivate the reader from the very first page." "I love Mary Sharratt. The grace of her writing and the grace of her subject combine seamlessly in this wonderful novel about the amazing, too-little-known saint, Hildegard of Bingen, a mystic and visionary. Sharratt captures both the pain and the beauty such gifts bring, as well as bringing to life a time of vast sins and vast redemptions." "Sharratt offers up an imaginative retelling of the fascinating life of the 12th-century nun Hildegard von Bingen....Though confined primarily to the abbey and peopled by a small cast, Sharratt’s gripping story, like Ann Patchett’s Bel Canto, is primarily about relationships forged under pressure." "In this affecting historical novel, Sharratt imagines the inner life of Hildegard, first as an angry child, then as a young woman nurturing the other girls forced into this restricted life, and finally as a mature woman leading her companions out of the anchorage, establishing the first monastic institution for women in Germany, and advocating an idea of religious devotion based on love rather than suffering. Psychological insight, passages of moving spirituality, and abundant historical detail—from straw bedding and hairshirts to turtle soup and wooden dolls—make this a memorable addition to the genre of medieval historical fiction."